14 NDB employees were awarded with the Lean Yellow Belt for identifying processes of improvement in their respective areas and implementing said processes. 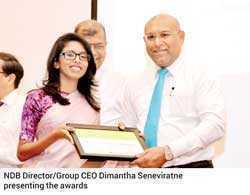 The awards ceremony took place in the presence of the leadership team of the bank and the certificates were presented by Director/Group CEO Dimantha Seneviratne who was the Chief Guest at the ceremony. Among the recipients of the award were Thilanka Chandrasena – Pettah Branch, Mahesh Thirimanna – SME-S, Nirmala Fernando – Trade, Melani Navaratne – Trade, Sumudu Rathnaweera – Retail Credit – Housing, Sahan Heshitha – Colombo 7 Branch, Prabhath Kaushalya – Finance, Champa Wickramanayake – Legal, Adithya Rathnayake – Warakapola Branch, Ranil Mahawatta – Shared Services, Rukmal Dharmadasa – SME – Middle Market, Pathum Kulathunga – Shared Services, Chamath Chathuranga – Shared Services, and Amitha Koralage – Transformation Unit. Lean 6 Sigma is a process where you Define, Measure, Analyse, Improve, and Control identified processes of waste and process improvements that are implemented with the ultimate goal of seeing a delighted internal or an external customer. The project, which is a brainchild of the bank’s CEO Deepal Akuretiyagma was spearheaded by the Transformation Unit and organised by the learning academy of the bank. NDB Bank which is the first and to date the only corporate in Sri Lanka to officially be certified with EDGE Certification, the leading and only global certification for gender equality at work place, is the parent company of the NDB Group, one of the fastest growing financial services conglomerates in Sri Lanka, with the strategic mission to be the dominant leader in the financial services and banking sector. From its inception, the group which includes NDB Bank, NDB Capital, NDB Investment Banking, NDB Wealth, and NDB Securities has been a catalyst in the development of the nation, strengthening and empowering entrepreneurs, corporates and individuals from all strata of the economy. Customers across all group companies have benefited from the product and service offerings of the NDB group.